Most VR managers update their rates each year. Bookerville's Copy Rates Forward feature makes this as easy as clicking a button. 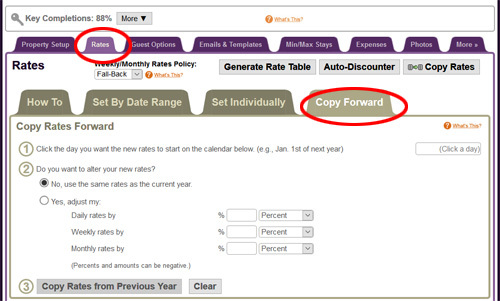 Quickly and easily copy your rates from the current (or previous) year to the next year forward. Bookerville lets you choose the start date, and allows you to apply rate increases (or decreases) as a flat amount or percent. Where is it? Go to the Rates tab for any of your properties, and then click on the Copy Rates Forward tab. Read the "What's This?" This small pop-up window will describe what the tool does and how to make it work. It's Smart! It's smart enough to align the new rates forward on week-days, so that weekend rates (if you have any) are kept on the weekends. It also deals with leap-years. Copy Rates Forward: another Bookerville time-saver!